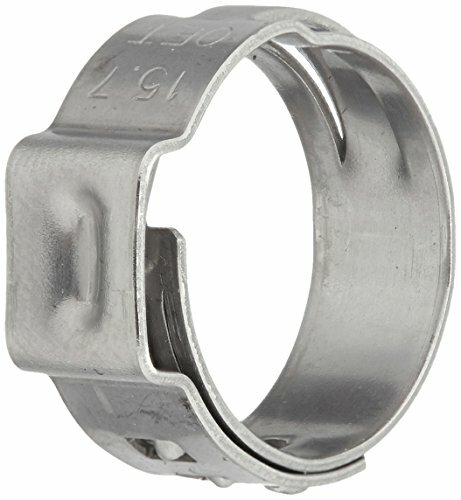 HIGH QUALITY MATERIAL Made of 100% stainless steel, these clamps are corrosion resistant and anti-rust. SPECIAL DESIGN Special cochlear design provides a strong thermal expansion compensation function, which compensates for the dimensional change caused by the change of the hose, so that the pipe is always in a good sealing and fastening state. 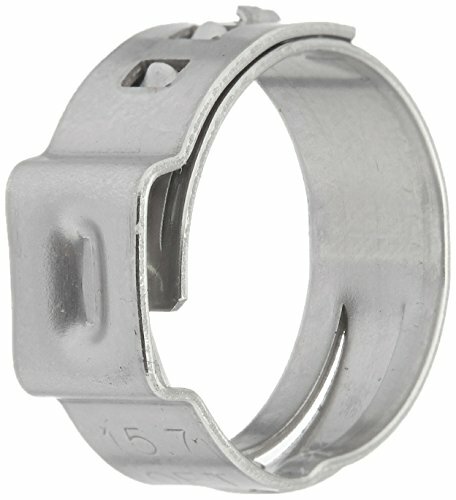 Narrow band design to provide a more centralized seal pressure, the clamping effect is obvious and stronger than that of the traditional screw type clamp. 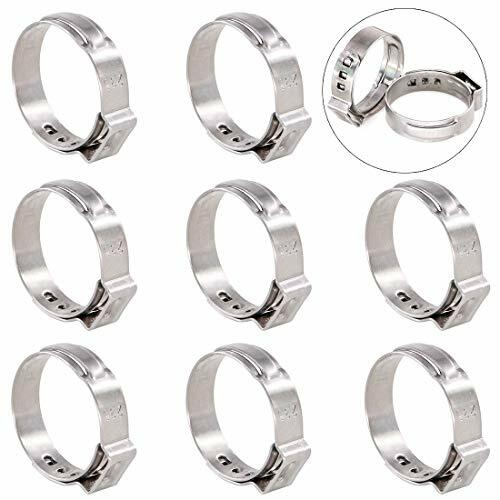 COMPLETE SPECIFICATIONS This single ear hose clamp set covers 8 common sizes items : 6-7mm, 7-8.7mm, 8.8-10.5mm, 10.3-12.8mm, 12.8-15.3mm, 15.3-18.5mm, 17.8-21.0mm, 20.3-23.5mm, which are widely used in hoses and plastic pipes, especially suitable for beverage, automotive, marine, motorcycle, and industrial applications. CRIMPING PLIER TOOL An useful Ear Clamp Pincer are included in this kit, with plastic coated handle, which is convenient for your installation widely applied to single ear hose clamps, double ear clamps, stepless clamps, etc. 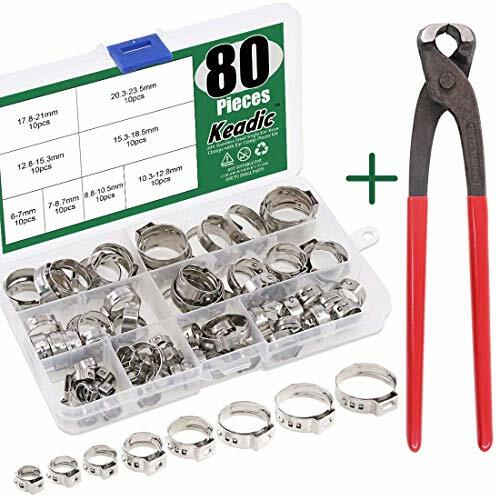 Swpeet 35Pcs 20.3-23.5mm Stainless Steel Single Ear Hose Clamps Assortment Kit Perfect for Automotive, Home Appliance Line WHY CHOOSE US? 1, Clamps can be Adjusted to Several Nominal Diameters, Clamps Suitable for Many Different Applications. 2. Simple, Quick Axial or Radial Installation. 3, The product is used in auto and Motorcycle. Dragging, machinery oil, water, gas, which makes the pipe joint seal more firmly! Specifications: Quantity: 35 pcs Material: 304 Stainless Steel Type: Single ear hose clamp Clamp Range: 20.3-23.5mm Package Included: 20.3-23.5mm ------------------35 PCS Note: 1.The actual product maybe slightly different from the picture shown due to lighting and the color setting of each individual monitor. Please allow the slight color difference. 2.All the sizes are for your reference only. 2~3 cm data error is allowed. Thank you for your understanding. 3,If you have any questions, please feel free to contact us at any time. 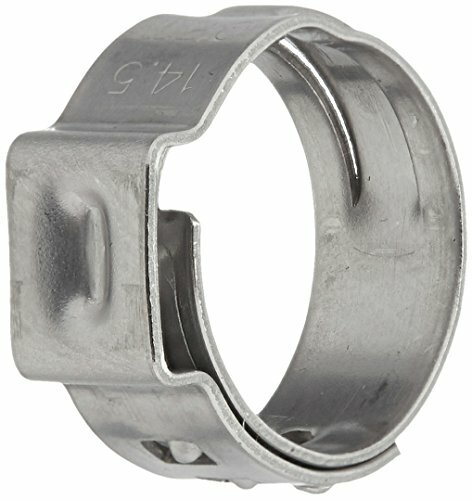 HIGH QUALITY ---- High quality 304 Stainless Steel hose clamp, Can resist the corrosion and rust in marine environments. ENVIRONMENTAL FRIENDLY ---- It can be reused and recycle if you do not want them to stay on the original place due to the high quality material which makes them worked last for long. WIDE APPLICATIONS ---- Typical use field: the hose of the car, home appliance line, trade export, machinery equipment. 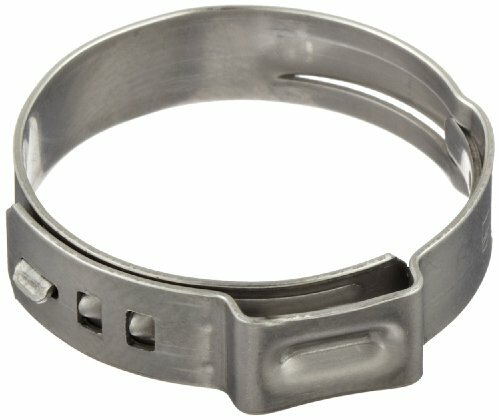 POWERFUL FUNCTIONS ---- Single ear hose clamps, unique points of edge grinding process, ensure the clamp the strip edge smooth.Suitable for Securing Neoprene Gaiters or Other Soft Materials. Easy to store ---- There is so many kinds of hose clamps, In this Kit, You will get 35 Pieces 20.3-23.5mm single hose clamp,They will packed in a bag, easy to install and store.If you have any questions, please feel free to contact us, we will solve your troubles as soon as possible. Oetiker invented the StepLess ear clamp in 1979. 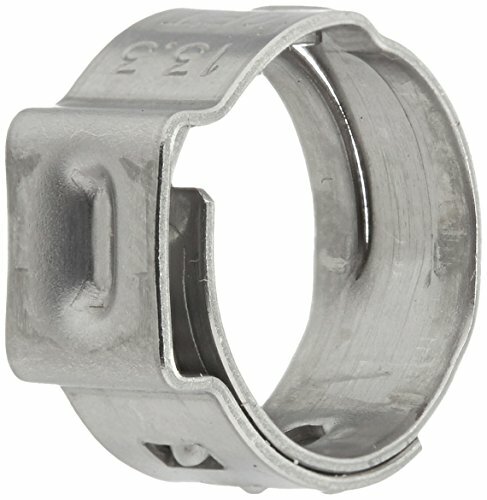 The ear clamp s special design eliminates steps and/or overlaps on the inner circumference of the clamp for a 360 leak-free seal. Because the tongue resides in a groove, the tongue-in-groove feature exerts pressure on the assembled parts over 360 , enabling the clamp to apply a continuous radial force completely around the connection s diameter. 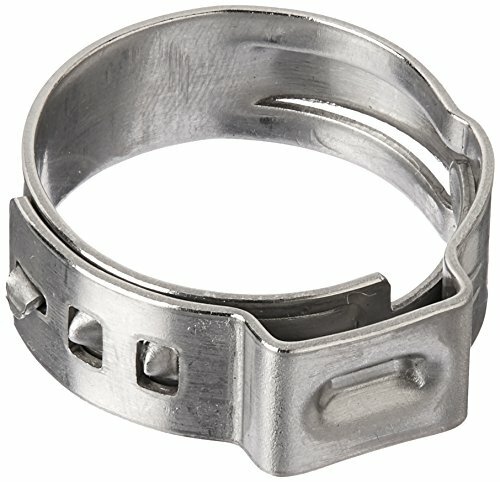 Ear clamps can be easily removed using Oetiker s hand clamp cutter (HCC). The HCC tool is designed to safely remove ear clamps. 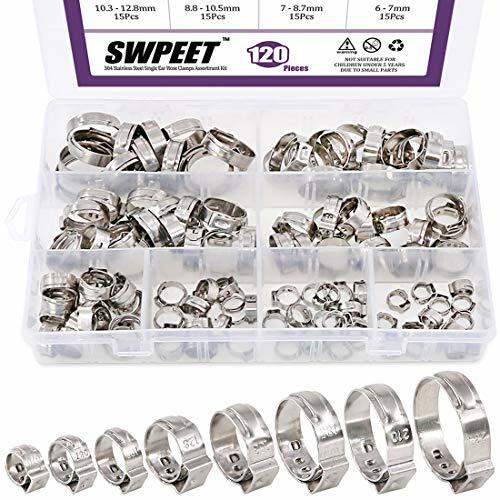 Swpeet 100Pcs 6mm-23.5mm Stainless Steel Single Ear Hose Clamps Assortment Kit Perfect for Automotive, Home Appliance Line WHY CHOOSE US? 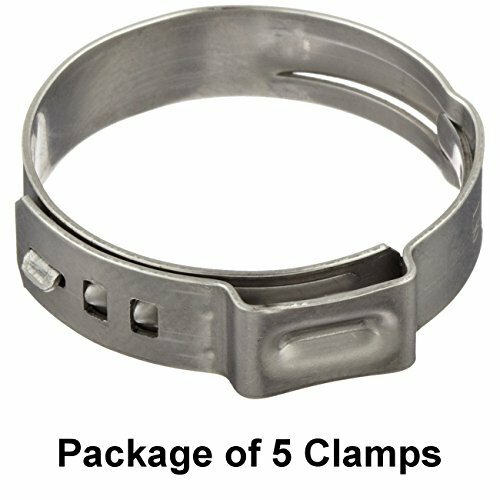 1, Clamps can be Adjusted to Several Nominal Diameters, Clamps Suitable for Many Different Applications. 2. Simple, Quick Axial or Radial Installation. 3, The product is used in auto and Motorcycle. Dragging, machinery oil, water, gas, which makes the pipe joint seal more firmly! 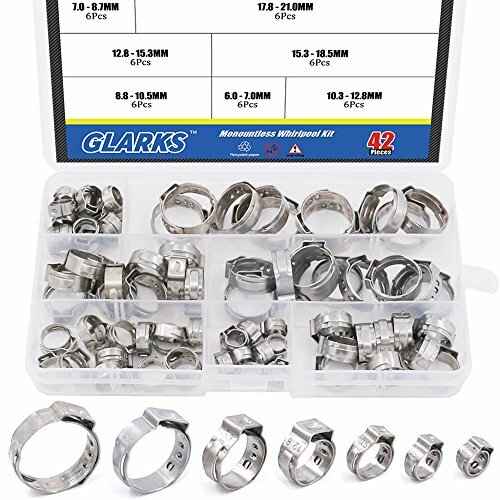 Specifications: Quantity: 120 pcs Material: 304 Stainless Steel Type: Single ear hose clamp Clamp Range: 6mm-23.5mm Package Included: 1 6mm-7mm------------------ 15Pcs 2 7mm-8.7mm------------------ 15Pcs 3 8.8mm-10.5mm------------------ 15Pcs 4 10.3mm-12.8mm------------------ 15Pcs 5 12.8mm-15.3mm------------------ 15Pcs 6 15.3mm-18.5mm------------------ 15Pcs 7 17.8mm-21mm------------------ 15Pcs 8 20.3mm-23.5mm------------------ 15Pcs Note: 1.The actual product maybe slightly different from the picture shown due to lighting and the color setting of each individual monitor. Please allow the slight color difference. 2.All the sizes are for your reference only. 2~3 cm data error is allowed. Thank you for your understanding. 3,If you have any questions, please feel free to contact us at any time. 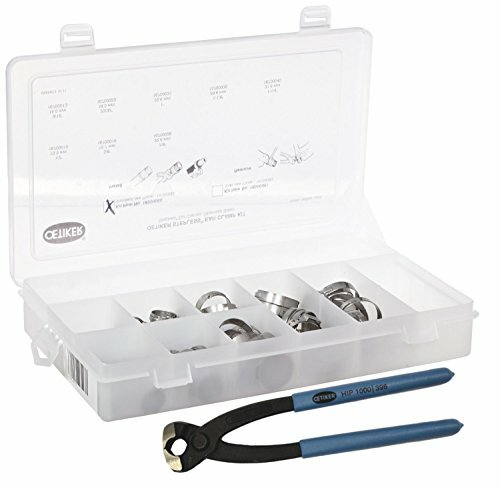 Easy to store ---- There is so many kinds of hose clamps, In this Kit, You will get 120Pcs 6mm-23.5mm single hose clamp,They will packed in a clear box, easy to install and store.If you have any questions, please feel free to contact us, we will solve your troubles as soon as possible. Please note - the size of the clamp denotes the Inner Dimension (ID) of the clamp. 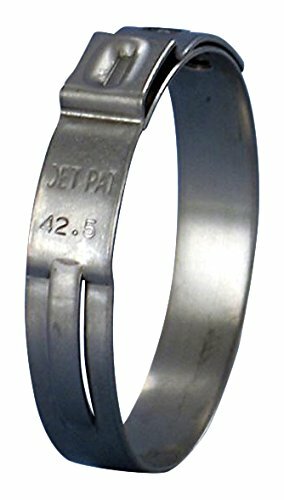 Genuine Oetiker Stepless clamps, made of Stainless steel, Material no. 1.4301/uns S30400. Lightweight design and tampering is visible. STPLSS Irrigation Clamp 45.3-48.5MM 1.50PO.